MITSUBISHI MATERIALS CORPORATION What's Carbide? We are surrounded by many metallic goods in our everyday life. Do you know how these products are manufactured? There are many ways to machine metals, but the most commonly used method is cutting. Here we are going to learn about cutting tools and cutting processes. What do we mean by saying cutting tools? Let's see the manufacturing process of carbide. First, mix tungsten carbide with cobalt to make powder which can be classified as raw materials. The granulated mixture is poured into a die cavity and pressed. It gives a moderate strength like that of chalk. Next, the pressed compacts are placed in a sintering furnace and heated at a temperature of about 1400°C,resulting in cemented carbide. After sintering, content volume shrinks considerably. Also, hardness of cemented carbide is at a level between diamond and sapphire and weight is about twice that of iron. Then, how do we cut this hard cemented carbide? 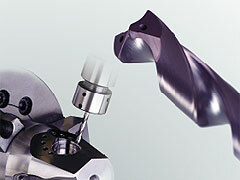 The figure on the right shows the condition of a cutting edge during machining. The cutting edge cuts the workpiece and chips are produced. The temperature at the top of the cutting edge becomes as high as 800°C because of impact and friction. Cemented carbide grades that can withstand these high temperatures are the most successful. 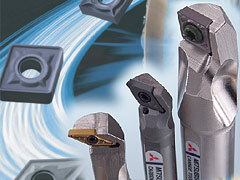 Carbide formed into different configurations are the most popular, and they are called indexable inserts. Indexable inserts are used for various shapes of holders and selected according to shape of the workpiece and cutting mode. External holder and internal boring bar produce round shaped workpieces. Machining processes that use holders or boring bars is called turning, and its main characteristic is that workpieces rotate. The machine used for turning is called a lathe. The tool in the photo left is a milling tool. 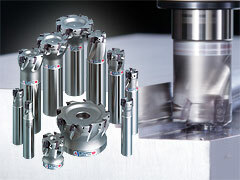 Milling tools can be divided into two types ; one is face milling which machines the workpiece surface and the other is endmilling which performs slotting shoulder milling etc.. Machining modes that use facemills and endmills are called milling operations, and its main characteristic is that the tools rotate. The machine used for milling is called a milling machine. Today cemented carbide tools have become a primary means for increasing metal cutting productivity, while research constantly develops new products for more accurate and faster machining ro reduce manufacturing costs.